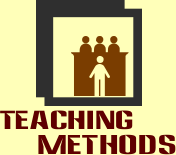 Teaching methods in class have also evolved with fast changing trends in syllabus and use of technology. Students needs to get engaged in lecture during class so they can learn to the maximum. We all are well aware of the fact that majority students have least interest in studies so they loose interest in lecture and you may even find them half sleepy during lecture. These are common issues faced by every teacher. But when there is a problem, a solution needs to be there. Certainly solution to student's dis-interest is also hidden in variety of teaching methods in class. Here, i would be sharing certain teaching methods in class which can help keeping students involved in lecture. Make it an interactive lecture in the class by asking certain questions, invite student's comments and their perceptions on the topic under discussion. Loud Voice is essential in keeping control and hold on students, further it also helps keeping them awake and grabbing their attention towards you. But be careful it should not be shrill or annoying for students. One of very effective method of student's learning and involvement is group discussion on a certain topic or case study or research paper which not only keeps students involved and busy but also make them using their mental skills. It is really a healthy activity. Give students certain creative tasks and assignments during lecture. For instance, you may ask them for role playing or creating collage regarding particular concept. You can even prepare certain scrabble and flash card games for them which they would participate in with interest. Share facts with the students, give them real life examples which goes on around them on daily basis. Particularly boys listen to such facts and examples with great interest. but keep you example relevant to you topic so they are able to learn the topic through those facts and examples. You wanted to discuss about the teaching methods in classes. Today teaching is very important for all. Thank you so much for submitting this post. I think you should visit the site for more. Article Re-writing is a Literary ability that most think that they possess, however, few really do. You will find Many motives for composing an guide and the tactic into the duty will Generally be determined by the main reason and necessary outcome. this website makes me happy with the qulity of service.